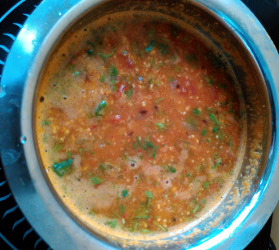 This sambar recipe is a popular south Indian recipe. 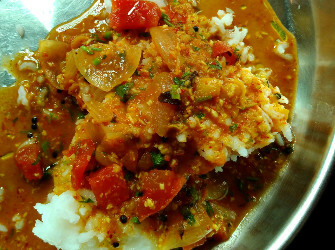 It is an important side dish that is served with Rava Idli, Dosa , upma, Idli, Steamed Rice - Plain rice etc. 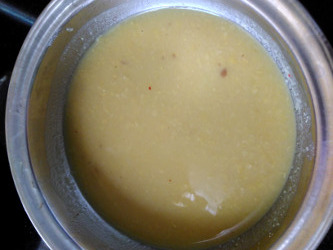 Sambar is made with yellow lentil called pigeon peas - Tuvar dal - toor dal and vegetables. You can use any vegetables of your choice such as onions, potatoes, tomatoes, brinjals, beans, cabbage, knolkol, raddish etc. you can use any one or a mix of these vegetables. Of course the freshly made sambar powder has a special taste, which I make once in a while when I have more time. I am using onions and tomatoes in this recipe. My family loves it. 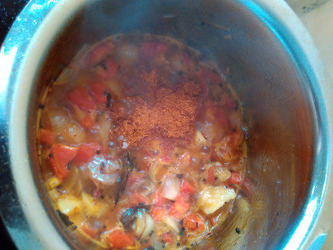 I am also making fresh sambar powder for this recipe. You may use 1 1/2 tbsp ready sambar powder instead if you do not have time to make fresh sambar powder now. 1. 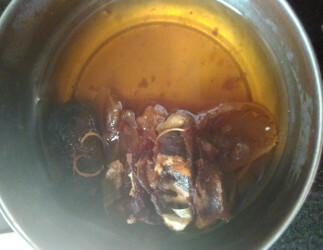 Soak tamarind in 1 cup of warm water for about 15 minutes. Squeeze tamarind and get pulp. You may use the pulp according to the sourness you like. 2. 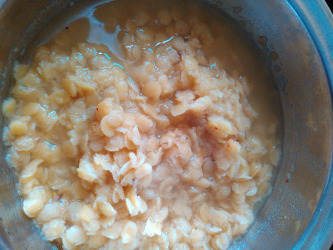 Wash 1 small cup toor dal and cook it in 1 1/2 cups water till it is soft. You may cook it on the stove top in a pot/pan. Or use a separator in the pressure cooker for toor dal when you cook rice. 3. Mash toordal using the back of a ladle or a potato masher. You may use a blender if you wish. Or you may just mash it up using your hand. 4. Heat vegetable oil/ghee in a deep thick bottom vessel or pan. 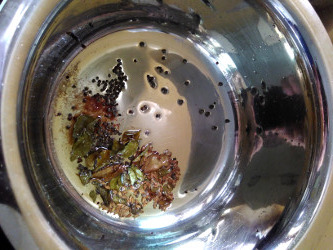 Add mustard seeds and cumin seeds. When they start spluttering add curry leaves. 5. Add hing/asafetida and turmeric powder. Add chopped onion and stir fry for a minute or till onion turns translucent. 6. 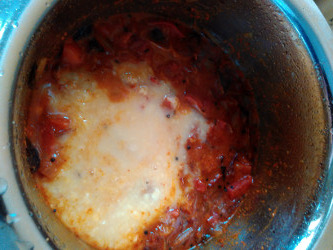 Add chopped tomatoes and cook till tomatoes become soft. 7. Add a cup of water after tomatoes are cooked. 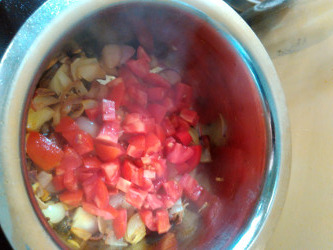 Add sambar powder. Mix and bring to boil. Let boil for about 5 minutes on low flame. 8. After 5 minutes, add cooked and mashed toor dal. Add salt and some tamarind juice/pulp (according to your taste). Add jaggery now if adding. 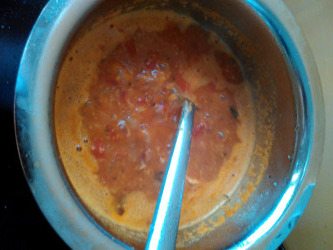 I have used onions and tomatoes in this sambar recipe. This is a favorite combination in my home. 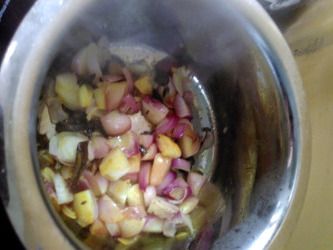 You may use small onions/shallots, known as sambar onion or Madras onion. You may also use some other vegetables such as potatoes, brinjals, green beans, carrots, okra(ladies finger) etc. instead of or along with onions and tomatoes.